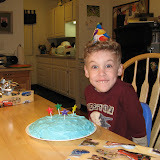 David got to have not one, but two birthday parties due to Spencer being under the weather on his actual birthday. 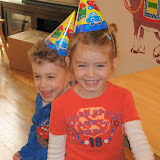 On Friday, we had a birthday party with just David, Daddy, Mommy, and Spencer. David requested a white birthday cake with blue frosting. Due to the fragile nature of white cake, he ended up with only one layer of cake, and it looked sortof like a cloud, so we called it a blue cloud cake. We postponed David's first official birthday party with friends until today. His friend, Lorin, arrived first, and they had fun dancing around to music while Jonathan and I finished preparing things. At the beginning of the party we just let the kids play with toys while we waited for everyone to arrive. We then played "Pin the Tail on the Donkey" using a donkey that I (Audrey) drew this morning from a picture found on the internet. Following the donkey mutilation, the kids had a mini-marshmallow relay race. Two teams had to scoop mini-marshmallows onto a spoon and carry it across the room to deposit the marshmallows on a plate. Sadly, many of our fluffy white comrades were lost in the heat of battle, but at the end of the race we let the kids eat as many marshmallows from the clean plates that they could in 60 seconds. Finally, we had the cool "Cars" cake and opened presents. It was a lot of fun, and we all really enjoyed the party. Thank you to Lorin, Jacob, Dallin, and Jack for coming to the party--and for their wonderful gifts! What a fun party it must have been! Thanks for the photos that let us share in the merriment! Looks like Everyone had fun! I loved the video clip of David and his Mack truck!